The 18-year-old French composer (who would later compose Carmen) won a competition for his setting of this improbable but hilarious opéra comique in which the Mayor of Padua is outwitted by Captain Silvio in his quest for the hand of the Mayor’s daughter, Laurette. The Italian composer’s colorful music sparkles in this early twentieth century chamber opera about a suspicious husband and his young wife’s surprising secret, and a stormy confrontation which eventually gives way to an unexpectedly sweet resolution. Outstanding singers and instrumentalists bring these classic works to life in just three performances! Based on a true event, this new work by Francis L. Lynch, the composer of Joseph’s Gift, uses just six singers and five players (flute, clarinet, violin, viola, and cello) in twenty brief scenes to relate the tale of a tragic episode in maritime history. Two outstanding casts sang the premiere performances of this new opera. 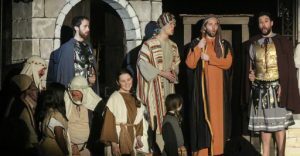 In December of 2016, EChO’s production team presented the world premiere of Francis Lynch’s Christmas chamber opera, Joseph’s Gift, at St. Matthew’s Episcopal Church in Evanston. Click the link below to learn about the production and watch a video of the entire opera.